Rustic Home Bunkhouse Bell Tower Deck 9+ Acres Horses OK Kingman AZ! 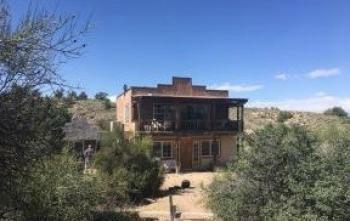 One-of-a-Kind, Charming, Rustic, Unfinished Western Ranchette that needs some loving attention to complete and restore. 4 Lots make up this nine-acre Ranch. Rustic Hm Deck 9+ Acs Horses OK Kingman AZ! There are 4 buildings in a natural hidden valley; the main house, an adjacent bunkhouse; the chalet, and the bell tower. The surrounding higher ground has several places that were graded but never used. There are LOADS of artistic touches in the design, construction, and decor. All furnishings included in sale. There is A LOT of construction debris that the owner is unable to remove, BUT there is Endless POTENTIAL here for the right person. Even Ostriches are allowed. Water haul. Underground electric from certain point. Rustic Hm Deck 9+ Acs Horses OK Kingman AZ! Bunk house is approx 128 sq ft; chalet is approx 195 sq ft; bell tower is approx 2,825 sq ft of which 1,138 is downstairs, and 1,507 is upstairs. In the bell tower, there is a 7 X 28 room upstairs in the back intended for indoor gardening. There is a fireplace in the bell tower as well as in the main house; both are plumbed for propane or natural gas. Directions: Please make an appointment to see the property. Hi Elise, Thanks for sharing your listing. This looks like a great opportunity for buyers in your area. I am sure this one will be marked sold very soon.